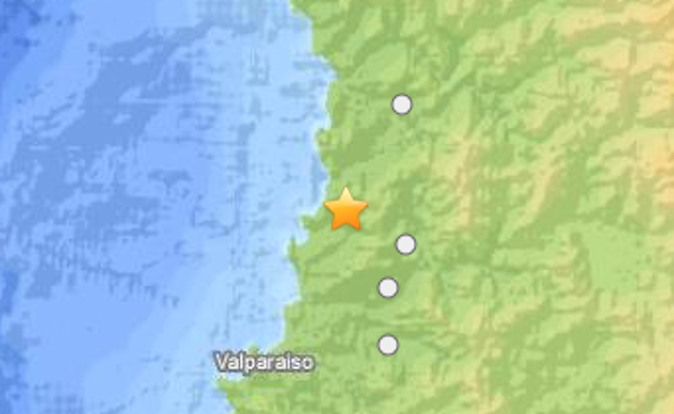 Earthquake Today in Chile: Magnitude 6.6 Quake Hits Valparaiso, Near Hacienda La Calera. The U.S. Geological Survey says a 6.6-magnitude earthquake has hit Valparaiso, Chile. The Weather Channel’s Nick Wiltgen reports that there is a high rise fire in Valparaiso, but it is unclear if it was directly caused by the quake. According to the USGS seismological survey, a preliminary report shows the quake was centered about 11 miles (18 kilometers) west-northwest of a community called Hacienda La Calera, around 118 kilometers (73 miles) from the capital of Santiago. See an AP update on the Bardarbunga volcano and earthquake below. REYKJAVIK, Iceland (AP) — Iceland’s Bardarbunga volcano burst forth with a small eruption Saturday under the ice of Europe’s largest glacier, scientists said, prompting the country to close airspace over the area. The remote area, 200 miles (320 kilometers) east of the capital of Reykjavik, is uninhabited. Icelandic authorities declared a no-fly zone of 100 nautical miles by 140 nautical miles around the eruption as a precaution, but did not shut down air space over most of the island nation in the North Atlantic. “All airports are open and flights are on schedule,” said spokeswoman Olof Baldursdottir. Pfeffer said it was not clear when, or if, the eruption would melt through the ice — which is between 100 to 400 meters (330 to 1,300 feet) thick — and fling steam and ash into the air. She said it could take up to a day for the ice to melt — or the eruption might remain contained beneath Europe’s largest glacier. Scientists were monitoring a hydrological station downstream from the volcano for flooding, a common result of volcanic eruptions in Iceland. Pfeffer said the amount of ash produced by the new eruption would depend on the thickness of the ice. “The thicker the ice, the more water there is, the more explosive it will be and the more ash-rich the eruption will be,” she said. Iceland sits on a volcanic hot spot in the Atlantic’s mid-oceanic ridge and eruptions occur frequently, triggered when the Earth’s plates move and when magma from deep underground pushes its way to the surface. Well-practiced emergency procedures mean eruptions in Iceland usually do not cause deaths. Authorities evacuated several hundred people, mostly hikers, earlier this week from the highlands north of the Vatnajokull glacier as a precaution. But the impact of the tiny island’s volcanoes has been felt around the world. Millions of people were stranded in April 2010, when aviation officials closed Europe’s air space for five days out of fear that ash from Eyjafjallajokul could harm jet engines. European aviation authorities later changed their policy, giving airlines detailed information about the location and density of ash clouds but leaving decisions to airlines and national regulators. A 2011 eruption of Iceland’s Grimsvotn volcano was far more powerful than Eyjafjallajokul but cause much less disruption to aviation. The budget airline EasyJet, which flies between Britain and Iceland, said it was operating as usual. It said it would use ash-detection technology, satellite data and other information “to determine what, if any, changes it should make to its flying program” in the event of an ash cloud. The chunk of closed airspace over the volcano extends over the North Atlantic, and Virgin Atlantic said a London-do-San Francisco flight took a detour to avoid it. Nicholas Wyke, a spokesman for continental air traffic controller Eurocontrol, told The Associated Press in an e-mail that it was difficult to estimate how many flights typically crossed that airspace, noting that trans-Atlantic flights vary their routes based on wind conditions. “It is unlikely that this danger area will have any significant effect on north Atlantic traffic,” he said.